Here are some of the unique products which Midwest Workwear offers that are hard to find anywhere else. High-Vis FR Combos: Our high visibility flame resistant clothing has a selection which is unmatched by anyone else. Plenty of retailers offer flame resistant or high-vis clothing, but Midwest Workwear is able to offer both features in a single product. Hunting Clothes: Midwest Workwear offers blaze orange and camo clothing options. We are proud to carry the blaze orange products made by Carhartt. Closeout Carhartt and Promotions: We make every effort to give you the lowest price allowed by Carhartt. Check out our clearance section for great prices. You can use the coupon code "EXTRA50" for an extra 50% off women's clearance items. We also have a page that lists current and upcoming promotions. Carhartt shirts are popular items, not just at our store, but all over the world. 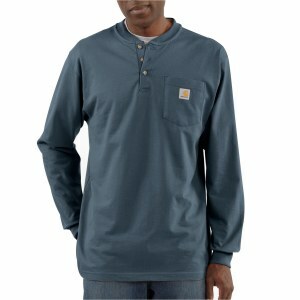 Carhartt makes a wide variety of shirts and styles. For example, there is knit shirts and woven shirts. The difference has to do with the way the garment is constructed and it gives the styles unique textures. This shirt is made for working. The Rib-knit collar and jersey-knit cotton body are made for durability. The side seam construction and the lack of a tag in the back enhance the comfort of this shirt, but you will really be happy to have it as an under-layer for cold weather. If you are looking for storage space, you will find that this knit shirt has a continentally located chest pocket. As always, we sell this item at the cheapest price allowed by Carhartt. This shirt is perfect as the weather starts to get cooler. The long sleeves provide the perfect amount of warmth. This knit shirt is made from jersey cotton and it can be layered or worn by itself. The crew neck design makes for a comfortable fit and the shirt is designed to minimize twisting. And finally, a Carhartt work shirt would not be complete without a chest pocket. Are you looking for something else? 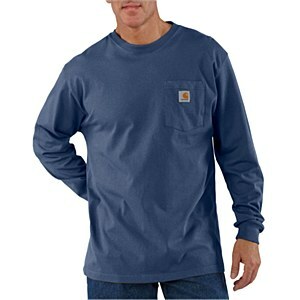 Check out our other knit Carhartt shirts or other woven Carhartt shirts for other options. In most recent times, clothing companies are trying to uncover insulation technologies that will defy traditional warming and cooling methods. Using spandex like material to trap as much heat as possible, makes the layering process easier. Companies like Under Armour and Nike, have been developing this thermal tech since the early 2000's, but have failed to make clothing with sustainable quality. In the last three years, Carhartt has stepped up to end this epidemic of expensive thermal wear that won't last. With three different types of long sleeve shirts and pants, Carhartt's thermal catalog is impressively simple. These specific styles are meant for various types of weather. After experiencing what Carhartt thermals have to offer, you will never want to go back to brands like Under Armour or Nike. To view all thermals, visit our navigation page that explains every product. Made from 100% cotton knit, this shirt naturally wicks off sweat while keeping you warm. The 100639 is 100% cotton vs the polyester. Cotton is the preferred material when you desire the ability to keep extra warm. Give the 100639 a go if you want to keep warm and dry. The 100640 is the bottom complement to the 100639. This thermal bottom is constructed of 100% cotton knit that naturally throws sweat off itself. With reinforced seams, you can be sure that this product will be no less reliable than any other Carhartt item. For all other products visit our home page. Fall and Winter can bring some brutally cold temperatures for people working outside, but Carhartt has some solutions to help you out. Carhartt offers many unique insulated pants that are intended to suit various jobs and activities. With different types of lining and levels of insulation, you can easily find out what style best solves the problems that come with the weather. This relaxed fit, fleece lined jean is ideal for anyone looking for insulated pants to stay warm. The B155 is composed of 15oz cotton denim and the insulation is made of 100% polyester. Featuring a straight leg style and a waist that fits naturally around the upper hip, the B155 has a natural feel that comes with many features to help you through the cold. It is also important to note that the B155 can act as a bib replacement if you do not desire the overalls look. Made specifically to attack the cold weather, the B194 is ready to conquer all of winter. The sandstone pant-overall is insulated with 100% nylon that traps heat, while not ruining the flexibility of the pant. The exterior is made up of 12oz cotton duck that has proved to be tough for years upon years. Its chap double front style adds a unique look and increases its versatility. Triple stitching and reinforced pockets make these pants close to indestructible. Lined with our 100% cotton flannel, the B111 duck pant is perfect for the cold. The outside is made of 12oz 100% cotton duck material. The B111's are made to fit naturally around the waste and they feature multiple tool pockets. Enjoy the comfortability of the B111 that is not surpassed by any other pant. Cooler weather means more preparation. Carhartt has many different styles of unlined bibs, but most customers do not know the differences between them. Carhartt unlined bibs are unique in their own way and each has a specific purpose. The styles R08, R07, R37, and R01 can accommodate any worker who needs bib overalls. From all season, to layering capable bibs, Midwest Workwear has you covered. Each pair comes with utility pockets and various other features. Feel free to read more on Carhartt unlined bibs to find out what qualities that could appeal to you. The R08 is the ideal unlined bib for any season. Its 100%, rough denim material is what makes these bibs so durable. Featuring multiple tool pockets and a hammer loop, the R08 will help you get the job done everyday. Reinforced pockets and triple stitching allows you to work without having to worry about ruining these stylish bibs. Made with 11.75oz cotton denim, the R07 unlined bib is heavy duty. This bib was washed to increase the comfortability and to protect the denim material. With various tool pockets and adjustable suspenders, the R07 will have the secure fit you desire with some helpful features. This 100% firm duck bib is built to last throughout every season. Featuring a zipper that starts at the ankle and goes all the way up to the thigh, the R37 is very easy to take off and put back on. These bibs can fit knee pads and hold various tools, which makes them ideal for any hard worker. The R01 is a cornerstone to Carhartt's inventory. For many years, this unlined bib has showed great popularity. Made up of 100% cotton duck and featuring double knees, for knee pads, the R01 is something to admire when looking for a bib. Many tool pockets and utility loops make this bib easy for anyone to wear. Midwest Workwear has had unbelievable success selling the 75-1305 high visibility jacket and we only expect it to continue. This simple, class 3 jacket is waterproof and built to last. Year after year, this jacket sells more than any other high visibility jacket because it is sold at a fair price and can protect you from all conditions of weather. If you are looking for a high visibility jacket, look no further than this Majestic made item. Priced at $39.99 and can match the class 3 standards, this jacket is perfect for anyone looking for a hi-vis jacket. 75-1305- High visibility, class 3 jacket. This jacket is composed of 100% polyester, coated oxford fabric, and is fully water proof to keep you safe. Our top selling hi-vis jacket also features a detachable hood and two outer pockets for convenience. This jacket's seams are fully taped to ensure that no moisture leaks through the protective membrane. Need a high visibility jacket? You can not beat this price ($39.99). For all other high visibility products, visit our protective apparel page. For all other Midwest Workwear products, take a look at our home page. Carhartt is well-known for creating the highest quality workwear around. Every day their brand is put to the test at thousands of job sites across the country. However, some confusion does exist about the different materials offered by Carhartt. Carhartt's duck material is known for it's strength. That is why their B11 Washed-Duck Work Pants and B01 Firm-Duck Double-Front Pants are made from this material. The material itself has is spun from 100% cotton duck and continues to prove its strength through its apparent versatility. There is often some confusion about Carhartt's sandstone material. Some customers mistakenly think that it is a color. However, the sandstone fabric is actually one of Carhartt's softer and more comfortable fabrics. Through a special manufacturing process, the material is given a softer feel which makes this product more suitable for wearing on the street rather than on the job. Still, products made with the sandstone fabric, such as the C26 Traditional Coat, are still durable and versatile. Although it is not as strong as the duck material, Carhartt's denim still offers tremendous strength and is ready for use in workwear jeans. Jeans are offered in a variety of different styles. Additionally, you can purchase products with a hammer loop if your work conditions require it. The B73 Double-Front Logger Jean is one such example of these workwear jeans. Carhartt clothes offer a few other features. For example, the YKK zippers used on the pants, coats, and jackets are well-known for being easy to operate and their durability matches that of the pants. Carhartt clothing truly is made from the best materials available. With Summer coming to a close and cool weather on its way, every hard worker should be preparing with the appropriate clothing. Although Carhartt has released many new fall products, we would like to emphasize the popularity of two particular best sellers by placing them on sale. These two shirts are very similar long sleeve, work shirts, but have always been cornerstones to the fall catalog. Both of these items are made up of mid-weight, 6.75 ounce material. The K126 crewneck and K128 henley were intentionally constructed for either layering or to wear by itself. The comfortable fit will keep you coming back to these durable, trustworthy shirts. K126- Carhartt, workwear shirt. This plain, 100% cotton shirt is built to last through any conditions. The K126 has proved its durability by consistently outperforming any other work wear shirt, while lasting many years longer than the average. K128- Carhartt workwear Henley. Perfect for cool fall weather, the K128 can act as a base layer shirt or be worn alone. Its rib knit collar and three button closure will add to its comfortability level. Finally, the side seam construction dismisses any problems with twisting and maneuvering. For all other Midwest Workwear products, visit our home page.